I don’t know about you, but, in my opinion, having great credit is almost as important as having a lot of money in your checking account. If you have ever not had credit, you know what I mean. Not having good credit really cripples you from doing the things, or having the things, you want or even deserve (like a house or decent car). Once you do have good credit, it’s important to guard that credit like it’s your own child, making sure it doesn’t get hurt or harmed. Read this article and get all the scoop on how to obtain your free credit report and then how to find some really good info once you obtain your credit report. 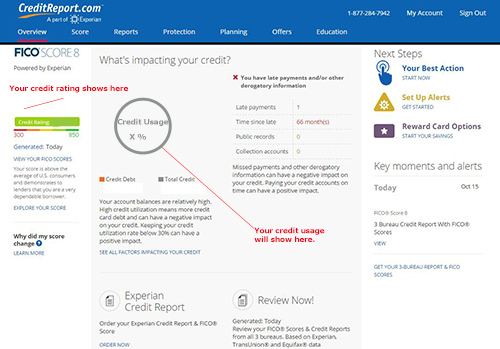 To get your free credit report, go to www.freecreditreport.com (an Experian company). 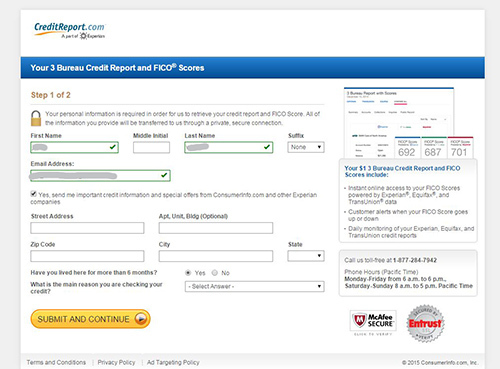 Click on ‘Get your free credit report’ button. You will have to complete the fields in a set of two screens as shown below. 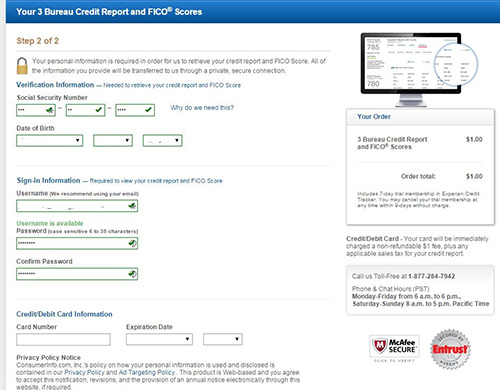 Ironically, for this ‘free credit report’, you do have to enter a credit card number. Make sure you cancel your subscription right after reading your report. If you don’t cancel in 7 days, Experian will hit you up for another $14.95 for a month subscription so don’t forget to cancel asap! Step 1 of the freecreditreport.com order form. Step 2 of the freecreditreport.com order form. Once you get done with the order, you will be displayed the home page of the freecreditreport.com application. This is what it looks like below. 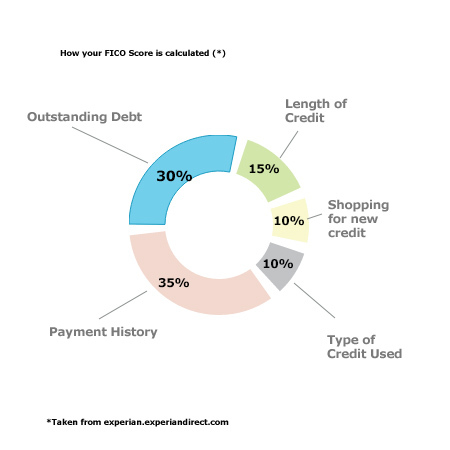 It looks like one of the main factors you need to watch out for is the % of credit you are using. From what I can tell, the credit reporting agencies seem to like individuals who have a lot of credit made available to them but they don’t use a large percentage of it. For example, if you have a handful of credit cards that add up to $20,000 in available credit and you have maintain $15,000 on them, that is looked at unfavorably. It would be better to have $20,000 in available credit but the balance due is around $5,000 or so. The other huge factor in your credit score is your payment history. It appears these credit rating agencies like to see someone who makes payments regularly and never misses a payment, or at least hasn’t missed a payment in many years. To help here, I suggest using auto-pay as much as possible. Missing a payment will really be hard on your credit score. Stay tuned for the follow up article that continues to do a deep dive into analyzing your credit report.